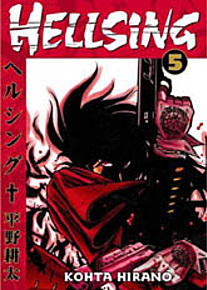 Intense and full of psychotic action, Hellsing continues its fevered pitch into a dark chaos that defies human logic. Human? Well, there are only a few left in the storyline as the emerging Millennium Project, an army of Nazi undead, is unleashed upon the world. What will surely ensue is a war of blood and nostalgia, with a coolly gothic style and increasingly frenetic pace. Envision the Hindenburg, old sharpshooter rifles and throwback uniforms, mixed with new jet technology and incredibly bold vampires. Hellsing is packed to the gills with radical mysticism and scary apocalypse ... and it's fun as Hell!